City-state launches another one of its new Littoral Mission Vessels. This week, Singapore held the launching ceremony for another one of its locally-built and designed warships. The ceremony, which occurs as the city-state’s navy commemorates its 50th anniversary, marks another step in its continued defense modernization. As I have noted previously, Singapore has begun launching its eight new Littoral Mission Vessels (LMVs), which will replace the existing fleet of 11 Fearless-class Patrol vessels which have been in service for 20 years by the mid-2020s. The LMVs, which are locally-built and designed by the Republic of Singapore Navy (RSN), the Defense Science and Technology Agency, and other local defense partners, represent a marked improvement over their predecessors. As I detailed in an earlier piece, there are various ways in which the capabilities of the ship support Singapore’s defense ministry’s (MINDEF’s) characterization of it as “smarter, faster, and sharper.” (See: “What Do We Know About Singapore’s New Warship?”). They also have the versatility to deal with a wide spectrum of challenges ranging from counter-piracy to humanitarian assistance and disaster relief operations. The LMVs have been gradually unveiled, with the first LMV, RSS Independence, being commissioned during the RSN’s Golden Jubilee on May 5 by Singapore Prime Minister Lee Hsien Loong (See: “Singapore Unveils First New Warship Amid Navy Anniversary”). RSS Independence was most recently involved in search and rescue efforts for the missing crew of the Dominican-registered dredger JBB De Rong 19 that collided with Indonesian-registered tanker Kartika Segara. The other three previously launched LMVs, Sovereignty, Unity and Justice are presently undergoing sea trials. 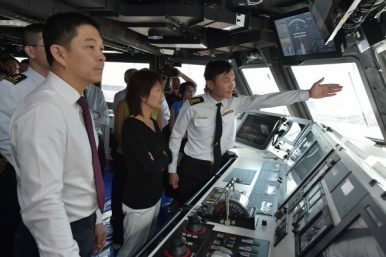 On September 23, Singapore Speaker of Parliament Tan Chuan-Jin officiated the launching ceremony of the fifth LMV, Indomitable, at the Singapore Technologies Marine (ST Marine)’s Benoi shipyard. Other officials and personnel were present at the ceremony, including Chief of Navy Rear-Admiral Lew Chuen Hong as well as senior officers from the RSN and the Defense Science and Technology Agency. In his remarks during the ceremony, Tan, like Lee, framed the progress in the LMV program in the broader context of the RSN’s evolution through its fifty years, from just three ships 50 years ago – two seaworthy wooden ships, the RSS Panglima and RSS Bedok, and a third ship, RSS Singapura, moored to serve as navy headquarters – to a full-fledged Third Generation Navy” with submarines, maritime patrol aircraft, and unmanned vessels and aircraft. He also added that the LMV program was testament to Singapore’s ability to overcome its manpower constraints using its innovative spirit (See: “Singapore’s Biggest Military Challenge”).